To understand processes at all oceanographic scales, from ocean basin to tidal basin, seafloor to surface, and within the thin sections of wave fronts and stratified nutrient layers, requires the complete set of observing and computational assets envisioned for the OOI. Many assets must be capable of finding and following transient and localized phenomena, wherever they occur, while other platforms must provide stable reference points over time and space. The short-term nature of many processes demands reactive control of high-speed measurements, while large-scale phenomena must be measured consistently over months, years, or decades. (Click to enlarge) Credit: OOI Cabled Array program and the Center for Environmental Visualization, University of Washington. Quantifying the air-sea exchange of energy and mass, especially during high winds (greater than 20 ms-1), is critical to providing estimates of energy and gas exchange between the surface and deep ocean and to improving the predictive capability of storm forecasting and climate-change models. Understanding how climate variability will affect ocean circulation, weather patterns, the ocean’s biochemical environment, and marine ecosystems is a compelling driver for multidisciplinary observations. Turbulent mixing plays a critical role in the transfer of materials within the ocean and in the exchange of energy and gases between the ocean and atmosphere. 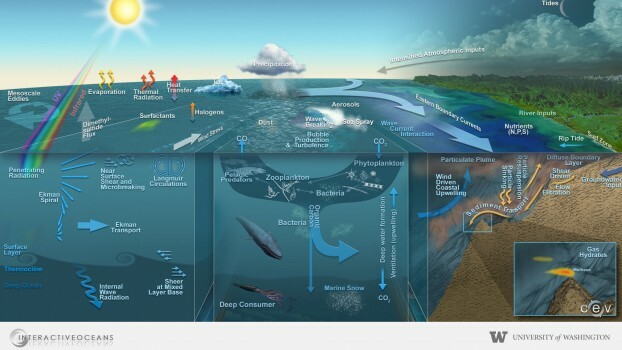 Horizontal and vertical mixing within the ocean can have a profound effect on a wide variety of biological processes. The coastal ocean is host to a variety of dynamic and heterogeneous processes, including human influences, which often strongly interact. This results in unique challenges for improved understanding and management of coastal resources in a changing climate. Many seafloor and all sub-seafloor ecosystems are inextricably linked to, and perhaps inevitable consequences of, the flow of energy and material between the earth’s crust and the deepest portions of the overlying ocean. 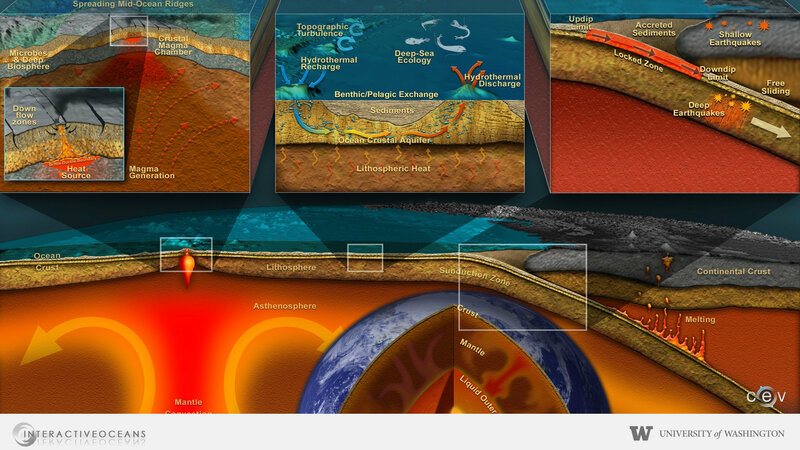 Lithospheric movements and interactions at plate boundaries at or beneath the seafloor are responsible for short-term events such as earthquakes, tsunamis, and volcanic eruptions. For more information on the OOI’s Science Themes, please see the Science Prospectus.